This is the third book in the "Blood of Eden" trilogy, and it wraps things up quite well. The villain is vanquished (in a nasty, bloody, thoroughly satisfying manner), the young lovers come together and conquer all, the ancient, guilt-ridden mentor sacrifices himself and gets his redemption, the innocents are saved, the snarky sidekick becomes a very reluctant hero and lives to fight another day, and the selfish heroine learns to love and discovers the value of family. That sounds like a paint-by-numbers, cliche-ridden book. It isn't. From the beginning, the strength of this series has been its characters. Allison Sekemoto, the dying protagonist who chooses to live, even if it means becoming a vampire, and struggles with her choice throughout; Ezekiel Crosse, the human who falls in love with the thing he hates and is eventually forced into the vampiric life himself, who learns to live with what he has become because of his love for Allison, and hers for him; Kanin, Master vampire and Allison's sire, plagued with guilt for sixty years because of his role in the evolution of the Red Lung humanity-destroying virus, who eventually discovers the cure lies within him and sacrifices himself to save the remaining vampires and humans on Earth; Jackal, Allison's "blood brother," the delightfully wicked sometimes-villain who shoots off quips faster than Spike from Buffy the Vampire Slayer, and who finally steps up at the end and kinda-sorta does the right thing. What a motley crew. They're all wonderful. Unfortunately, the villain, Sarren, isn't quite as finely drawn as this; he has his motivations, but he's mostly just batshit crazy. However, he does Get His Comeuppance at the end, oh yes. Having said all this, I do have a few rants. One is something I've mentioned before, when reviewing the second book in the trilogy, The Eternity Cure. This point being that TECHNOLOGY IS NOT GOING TO WORK SIXTY YEARS AFTER CIVILIZATION ENDS. Internal combustion engines are not going to be operative after rusting away for six decades; gasoline is going to break down into something so gummy it renders said engine inoperable, even if it was in pristine condition (which it couldn't be, with no maintenance; and there certainly won't be any siphoning the fuel out of sixty-year-old tanks, as Our Heroes persist in doing); and automobile batteries are going to be deader than doornails. Also, when Our Heroes visit the vampire city and find the Master Vampire's tower replete with electricity and hot water, I groaned and had to force myself to proceed. I mean, in the absence of any clearly stated non-fossil-fuel power source, such as solar panels, just where did that electricity come from? Unicorn farts? ...Which brings me to another rant. (Forgive me for stating the blindingly obvious, and also for being a hundred years too late.) Vampires. I do like them, but I think they belong in supernatural, urban-fantasy type universes. Unfortunately, the author is building this universe towards the science-fictional end of the spectrum, and her more-or-less classic vampires stick out like a sore thumb. I mean, without a beating heart, and without circulating blood, and missing some mystical or Godly intervention, they simply couldn't exist. Sorry, your brain isn't going to work without blood moving through it, and let's not even get into the issue of decomposition. What makes this worse is the trilogy is titled "Blood of Eden," and vampiric/human blood plays a pivotal role in the plot; but if your blood isn't moving through your veins, it either thickens to chunky peanut butter or breaks down into its component parts, just like gasoline (and without the vampire's bone marrow working, there wouldn't be any new red cells/white cells/platelets to replace it). Either way, injecting the cure made in Ezekiel Crosse's system before he died into Kanin, Allison or any other vampire wouldn't accomplish jackshit. Now, despite all this, I'm placing these books on the Recommended shelf. The writing is just lovely and the characters are unforgettable. I was personally able to hurdle the glaring holes in the worldbuilding. You may not be, so be warned before you take the plunge. 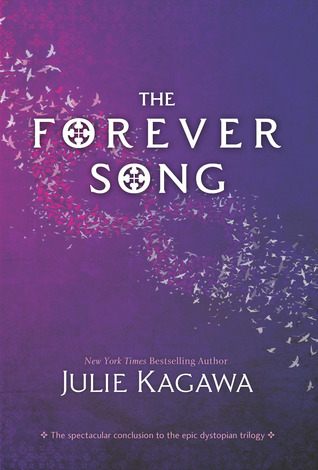 Sign into Goodreads to see if any of your friends have read The Forever Song.